Hello Readers its time to share another recipe!😊 This recipes was requested of my youtube viewers I will be posting 2 different way of making the filling. So that way you can choose which one and also for those of you have seafood allergy. 1) In a cooking pot over medium high heat add in the cooking oil once the oil is hot add in the garlic sauté until its start turning golden brown. Then add in the shallot cook it until it get translucent. 2) combine the soy sauc, sugar meat together. Then add in to the shallot and garlic saute it for about 30 minutes or until the sauce is almost gone. Add in the water, cook it until meat is tender for about 45 to 1 hr. Stirring occasionally add water if needed 1/4 cup at a time. 3) If using oyster and hoisin sauce add it when meat is tender and the sauce is getting thick. Turn off the heat and let it cool completely. 4) Sprinkle 1 tbsp granulated sugar into the warm milk, then add in the yeast stir in and set it aside until it gets foamy. 5) combine all the dry ingredients flour, salt, and the rest of the sugar. 6) Into the dough bucket add in the yeast mixture first, follow lard/shortening, flour mixture and lastly the egg. let the machine knead the dough. 9) Form each dough into a ball then flatten it for about 1/4 inch thick of 5 inch circle. Take 1 tbsp of the filling and place it in the center and start folding the inch of the dough. fold and pinched until you reached the other end. and start twisting then pinched it to sealed. Or you can just pinched all the ends of the dough if you just want you siopao to be just simple. 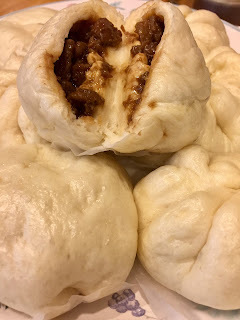 Take a piece of the wax paper and place it at the bottom of the siopao. 10) Fill in Half full of you steamer with water and then let it boil over medium high heat steam the siopao for about 12- 15 minutes. Make sure you leave spaces atleast 3 inches to prevent the siopao from each other. Let it cool for 5 minutes before serving. Freeze the left over heat.